We love the private plunge pool that each suite features – the perfect place to relax with a long and very cold drink as you look down on the scenic river below! Excellent guiding and the reserve is also very well populated with game so an excellent game viewing experience awaits you! If you’ve got kids then sorry, but no children allowed at this lodge – but Ecca Lodge is a stunning option on the reserve for families! much of your time will no doubt be spent on your suite’s expansive viewing deck which overlooks the river - here you can also relax in your own private plunge pool sipping on a glass of wine whilst watching kudu come down to drink at the river’s edge! Perhaps the biggest success story of the last 20 years in the Eastern Cape has been how huge tracts of marginal farm land have been restored back to pristine bush through the formation of a variety of game reserves boasting top class private game lodges – and Kwandwe Private Game Reserve represents a major chapter of this success story! 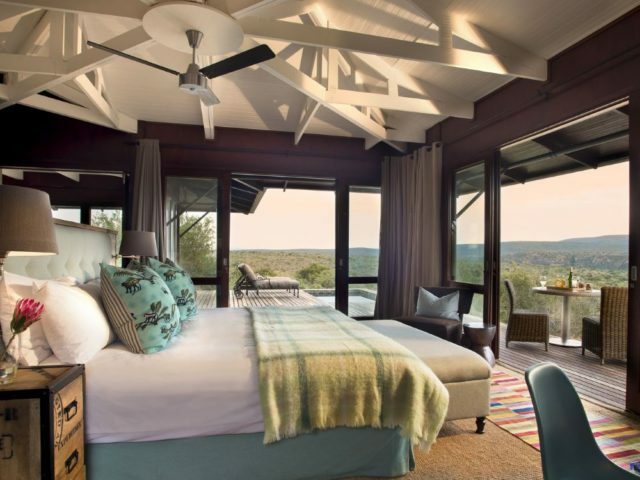 This is where 22 000 hectares of previous farm land straddling both the north and south banks of the Great Fish River has been converted into an award winning Big Five game reserve featuring a number of stunningly luxurious lodges. 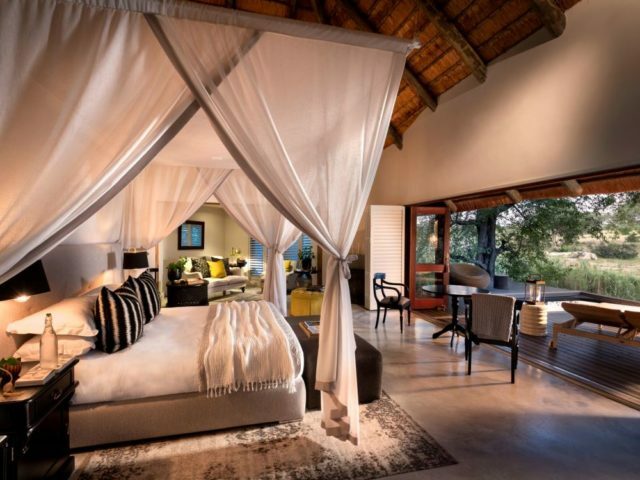 Great Fish River Lodge is the flagship lodge of the reserve and features a classic-contemporary style of simple elegance that embraces the lodge’s splendid setting, high up on a steep bank overlooking the Great Fish River. 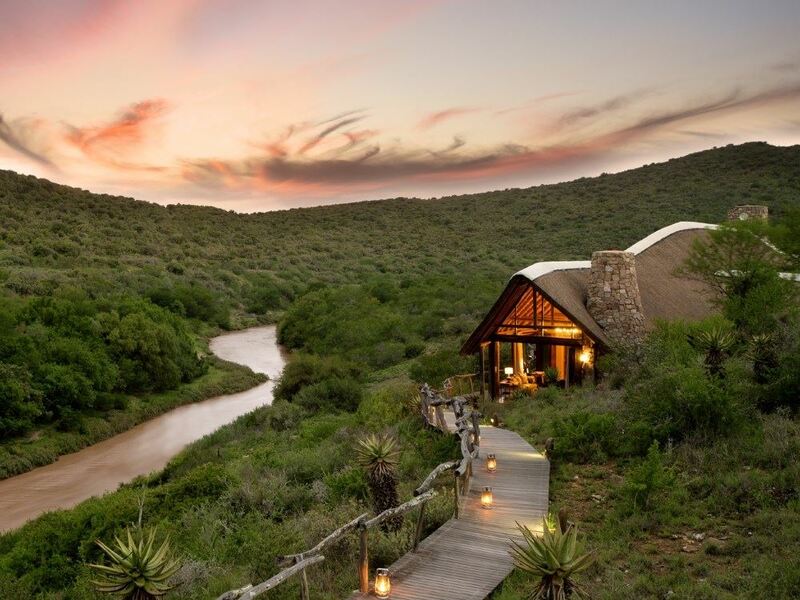 This is a majestic place where you can watch kudu meander down to the river or observe playful cape clawless otters swimming in the cool waters below - all from the comfort of your suite. 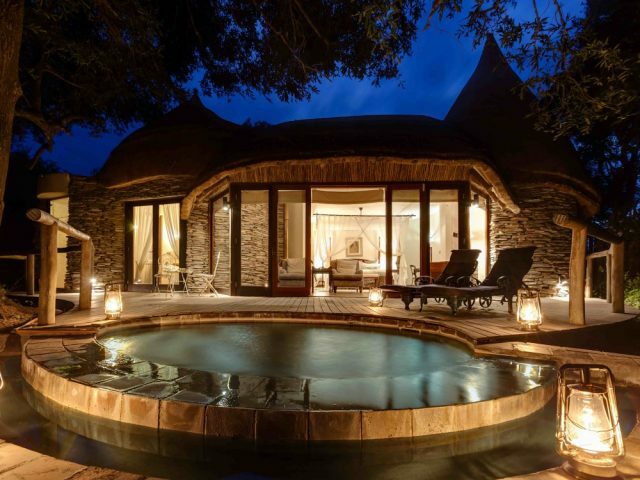 The nine luxurious thatched suites have been designed to take full advantage of the spectacular scenery – the first thing that catches your eye as you walk into your suite are the floor-to-ceiling framed glass doors which fold back to reveal uninterrupted views of the wilderness! The colour scheme of these spacious suites comprise of a calming palette of natural earthy tones - from khaki browns to charcoal greys. On top of that pewter and glass add an effortless yet understated glamour to the furnishings, whilst artefacts such as ostrich eggshells, hides and horns create the link between the rooms and the surrounding bush. Bringing these natural materials into the interiors of the rooms successfully blurs the distinction between inside and outside. The result is an elegant and sophisticated style which whispers luxury rather than shouts it. Much of your time will no doubt be spent on your suite’s expansive viewing deck which overlooks the river - here you can also relax in your own private plunge pool sipping on a glass of wine whilst watching kudu come down to drink at the river’s edge! In summer you can keep cool with overhead fans and air -conditioning and another highlight has to be the en-suite bathrooms, complete with both indoor and outdoor showers as well as a large bath (which you can enjoy if you can't bring yourself to showering outside in the winter months. The public areas in the main lodge are similarly stylish and welcoming. They’re also spacious, with a wraparound viewing deck which leads off from the dining room, bar and lounge sitting area. We love the fire places in the sitting, library and dining areas, perfect for snuggling around with a hot cup of Amarula hot chocolate on those cold winter nights! Dinners can be enjoyed either on your own private viewing deck under a canopy of stars (this is ideal for couples), in the cosy fire-lit boma or the gracious dining room. Rugged natural materials like rock, stone and thatch combined with soft-light lanterns and deep overstuffed couches create a simple but sophisticated ambience which invites you to linger and chat with fellow guests in a relaxing and tranquil space. Away from the lodge the good news continues. Kwandwe may be less than 2 hours drive from Port Elizabeth yet it feels as though you are in a truly isolated piece of wilderness. A highlight of the reserve has to be the 30km of privately owned river frontage which adds immensely to the reserve’s scenic appeal as well as acting as a hugely important water source to the animals. More than 7000 animals were originally relocated onto the 22 000 hectares and the Big Five roam free. Kwandwe's vast landscape is affected by the ocean, with south-facing slopes capturing moisture from the sea breezes - resulting in denser or taller vegetation and brightly coloured lichens. In contrast, the north-facing slopes tend to be drier and more open and therefore feature striking aloes which flower in spectacular profusion during the winter months. As if this diversity in vegetation isn't enough forest-like thickets of Euphorbia trees also grow on the steep, south-facing slopes – where these spiny plants are immune to destruction from most animal species (except the black rhino) thanks to the poisonous milky latex they exude! 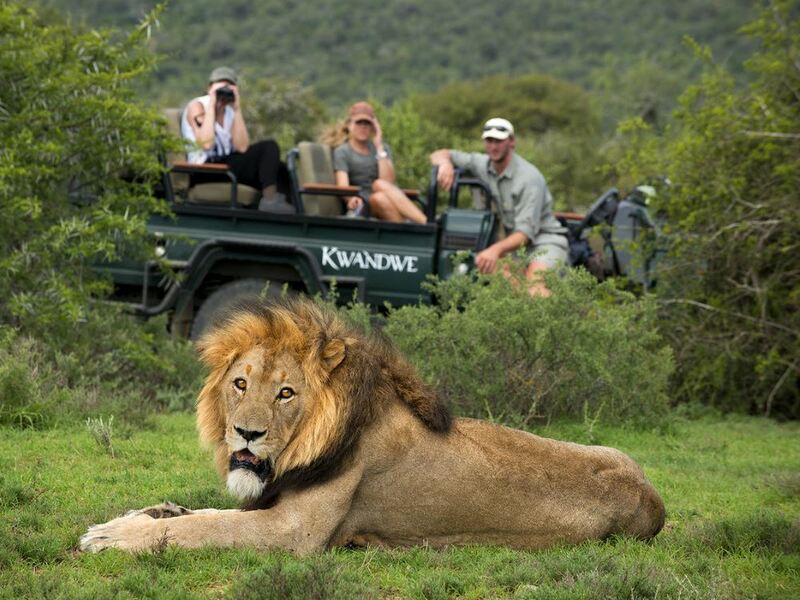 At Kwandwe you will accompany a ranger and tracker team on your twice daily game drives in private open safari vehicles – night drives often result in unusual sightings such as the rarely spotted porcupine and the aardwolf and aardvark! Between game drives you can take a closer look at the subtle, unseen wonders of the bush on a leisurely walk. On foot you can explore the dense thickets, which reveal a secret world of lichen, mosses and ferns. The reserve is also a paradise for birdwatchers - in fact the meaning of Kwandwe in isiXhosa is “Place of the Blue Crane” and the reserve is home to a population of these rare and endangered birds. If you can muster up the energy to take on some more adventures during the day instead of lounging about in your plunge pool, Kwandwe also offers rhino monitoring –you can spend 2-3 hours tracking rhino with the team and learn about the habitats of this threatened species as well as Kwandwe's conservation efforts. You can also take a Flight of the Blue Crane which is an hour’s flight in a fixed wing aircraft over the Frontier Region – or if this is all too hectic for you then you can either unwind and relax with a massage on your deck or enjoy a slow boat ride on Galpin Dam to the moored floating deck for a few sundowners! Everything at Kwandwe takes place on a grander scale, but it is the attention to detail and expansive, unmatched vistas that ensure your game-filled getaway is like none you have ever experienced before!